When was the last time that you've went to a carnival that allows you to experience the nostalgia of going on a merry-go-round, winning big fluffy stuffed animals, and letting the taste of sweet candy floss dissolve in your mouth? A while ago, I must imagine. 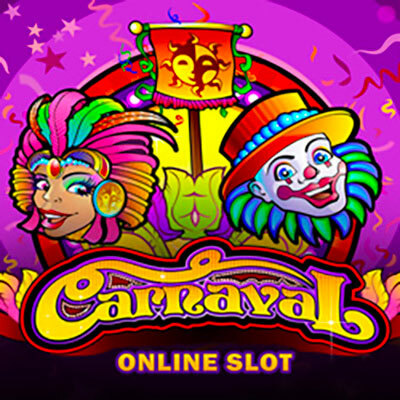 Well, you can relive that nostalgia from the very comfort of your own home by playing Microgaming's online slot game, Carnaval. Made for your enjoyment, Carnaval brings you the experience of being in an actual carnival and making big winnings at the same time! You would be called a fool if you think that Microgaming is just another ordinary game developer that create and release mediocre slots for you to play at casinos online. As they've been established in 1994, around the same time Google was first spoken of, they people behind the name have gathered enough wisdom about how each slot game should be developed in order to let the players reap as much benefit from them as they could. Even though they always remain up to date with the latest technology that's dominating the market, there's always an element of traditionalism that they put into most of their products. Burning Desires, Jack in the Box, and Cops & Robbers distinctly show this, and you will be able to see it too once you load up Carnaval on your device. All of the lively sounds and bold colours that appear on your screen will fill your ears and eyes with joy when you load of Carnaval on your device. The base symbols that will show up on your reels will only enhance the sensation of you being on the lively playgrounds of the carnaval from the very comfort of your home. The Carnival Lady, the clown, the Carnival Banner, and the trumpet are the base symbols that you'll need to get the winning combinations on the reels. And because everything is bright and bold in the carnival, Microgaming doesn't want you to miss seeing the WILDS and SCATTERS that will help amplify your prizes. WILD symbol: This symbol will only appear on the 2nd, 3rd, and 4th It replaces all of the base symbols to help you get the winning combo you have your eyes set on, and if you get more than 1 winning on a payline, you get rewarded with the value of the highest combination. SCATTER symbol: This symbol will appear on any of the reels, and if you get 3, 4, or 5 of them, you'll receive a prize that's calculated by the multiplication of the SCATTER symbol payout. If you're quite familiar with the way that Micrograming develop their online slots, they like to keep the game boards simple, and they features limited so you won't get confused with all of their symbols and the values that they hold. Furthermore, the carnival theme that they've implemented in this game will make you feel like you're wandering through the playground itself, so why don't you relive your childhood memories and win some big prizes today?